Casa Cicero is built on the foundation of the Roman Orator and Senator, Marcus Tullio Cicero who lived during Julius Caesar's Rome. 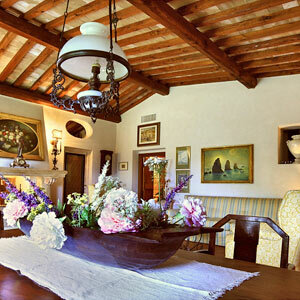 The charming location, with magnificent views of the Sabine countryside assures a relaxing and peaceful vacation. Ideally located to reach cities in Umbria and Lazio, with trains leaving every 15 minutes to the city of Rome you will be there in 45 minutes. Beautiful medieval villages are dotted on the hills under the Sabine chain of the Apennine Mountain range. During the summer, there are many fairs and festivals that have been in the Sabine inhabitant's rituals for centuries. Day trips to the Abbey of Farfa, the Sanctuary of Vescovio and architectural sights are just a few of the things that are waiting for you. Enter off the terrace into the spacious open area living and dining room. A beautiful set of wood doors opens into the light and airy, fully equipped. A hallway takes you do a Queen Bedroom and a hall bath with Jacuzzi and shower. Further along the hallway is a second living room which leads to a second terrace overlooking the swimming pool. A short staircase takes you up to two additional bedrooms. Here you have twin beds and a queen bedroom, sharing a bathroom with shower and walk in closet. The front door has its own private terrace, as well as the larger terrace off the second living room that leads out to the swimming pool that sits among the gardens surrounding the house have olive groves and old oak trees with stunning views of the Sabine valley and hills. At the end of a garden, fenced off for safety, is the ruins of the Roman Senator Marcus Cicero's villa. He loved his farm and came to his villa as often as he could, where he retreated from the heat of summer and in times of stress and danger. Ancient and beautiful Roman ruins are set within the private gardens. The ruins were the original summer villa of Marcus Tillius Cicero, who lived from 106 to 68 BC.